An ancestor whom I long had interest in, was my father's direct matrilineal ancestor Mary Anne Slaterus-Pike (1844-1916). 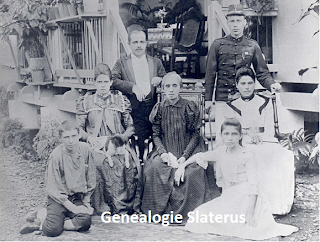 The only family stories about her were delivered by her granddaughter, my great-great-grandmother Jkvr. Frederika Mallien-Leyssius, who, according to what is told me, loved telling all her stories in the East Indies again and again: "Did I already tell you...?" Told or not, she would speak. About her grandmother Mary Anne Pike, not an awful lot was known nor told. She was born on her father's ship, which was told to be a pirate ship - of course, this was to colour the story - but it turned out that it was true Mary Anne was born on board of her father's ship. Furthermore, the story rose that she was related to a "bishop Pike", but for this no clues have been found. Some research about her was done by Christiaan van Vuure, who worked together with Henk Slaterus on the family tree Slaterus. In a journey to Padang on the island of Sumatra, and found information on the background of Mary Anne Pike. Her parents were Michael Lawrence Pike, a captain from India (Jaggernaikpuram) and the native baptized woman Sophia. Furthermore became clear that Michael Lawrence Pike was the son of the identical named Michael Lawrence Pike and Wilhelmina Dirksen. Padang, ca. 1900 (thanks to Christiaan van Vuure). About this picture is written on the Slaterus blog. Research in the online databases of familysearch.org and the British Library, passenger lists on google books, and contacts with possible family member Carrie Butler, made it possible to create a pedigree of Mary Anne Pike. It is shown below, written in Dutch. In the familysearch.org database I firstly stumbled on a Michael Laverence Pike, born in Churston Ferrers, Devonshire 1746/7. He was the only of that name in the whole database. Though one does have to be aware of coincidence, this is a name too rare to be not connected with the Pikes in the East. On google books, in journals like "The Asiatic Journal", a captain M. Pike was mentioned, travelling on his ship "The Reliance" along the shore of eastern India. That this was to be understood as Michael Lawrence Pike senior is due to the fact that once miss Dirkes with some relatives (miss A. Dirkes = Anna Elisabeth Dirksz or Aleida Theodora Dirksz , master B. Dirkes = Benjamin Thomas Dirksz) travelled with him. In lists mentioning Michael Laverence Pike (*1746/7) from Churston Ferrers, this person is called a leaseholder. This means he was quite an agrarian. This Michael Laverence Pike was not the right person to be married to Wilhelmina Dirksen. He was just "to old," and besides that was an agrarian. More logically, he could be an earlier member of the family travelling to India. Contacts with Carrie Butler, who also descend a Pike from India, revealed she also thought Michael Laverence Pike had something to do with the later Michael Lawrence Pike x Wilhelmina Dirksen, but was not sure how these two people connected to each other. Quite soon after, she said she may have found a solution: in chronological and geographical ways it made a very good sense. 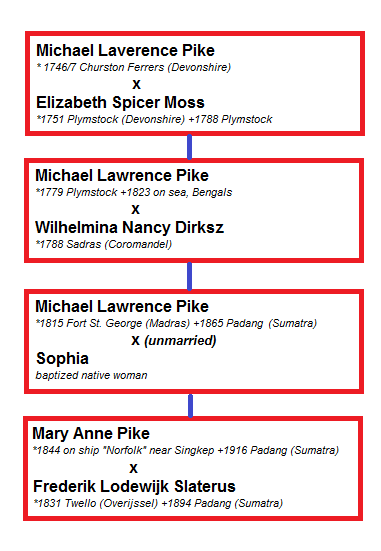 She found a Michael Laverence Pike married to Elizabeth Spicer Moss in the parish of Plymstock, a village some east of the harbour town Plymouth. As Plymstock only lay 30 miles from Churston Ferrers, the name Michael Laverence Pike was quite unique, and Plymstock was close to a harbour city, we may identify this Michael Laverence Pike with the one born in Churston Ferrers. In a document he deals together with presumably family member Walter Avent Moss with the business of some ships, which means he is connected with sea faring affairs. In the document he is called "of Preston" which according to me is to be read "of Oreston", a parish close to Plymstock. 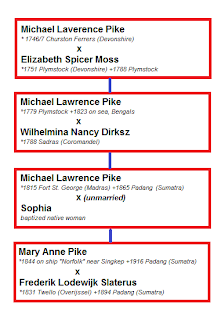 Together with Elizabeth Spicer Moss he got five children, among one was Michael Lawrence Pike (born 1779). It seems rather logical to me that this Michael Lawrence Pike (1779), born in a village near to sea and with a father coping with sea faring affairs, was about to begin a career at sea. I propose to equate him with the captain M. Pike of the "Reliance", married to Wilhelmina Dirksen. In the pedigree below I included some more information (it is in Dutch). Concerning Wilhelmina Dirksen, I found her on familysearch.org, baptized in Sadras as Wilhelmina Nentie Dirksz (with Nentie "Nancy"), daughter of Christian Bernhardus Dirksz and Maria Mentie Gevel. In the pedigree more is said about them also. Attempts to map their ancestry are not yet made, but this will be very difficult, as the registers from the Coromandel coast have not been preserved very well. A pedigree of Mary Anne Pike. 1 Mary Anne Pike, geboren op 15 februari 1844 op haar vaders schip “Norfolk”, nabij het eiland Singkep (Oost-Sumatra), overleden te Padang op 23 november 1916.Zij was gehuwd te Padang op 5 oktober 1863 met Frederik Lodewijk Slaterus, boekhouder, geboren te Huize Cruysvoorde, Twello, op 11 november 1831, overleden te Padang op 11 december 1894, zoon van Frederik Lodewijk Slaterus en van Anne Marie Wilhelmine Lohman. 1. Michael Lawrence Apon, geboren te Padang op 1 april 1851, overleden aldaar op 28 mei 1852. 2. Nicolaas Pike, geboren te Padang op 8 april 1853, jong overleden in de jaren 1880. 3. Louise Henriette Pike, geboren te Padang op 22 juni 1855. Zij is gehuwd met Charles Louis Baier. Zij vertrokken naar 's-Gravenhage. 2. William Pike, geboren te Padang op 26 augustus 1847. 1. Michael Pike, born at Coringa 2 januari 1806, gedoopt te Calcutta 4 januari 1807, overleden 21 mei 1811. 2. Captain William Pike, geboren in 1808, gedoopt te Fort St. George 23 september 1809, diende in de country service, overleden te Coringa 9 juni 1841. 3. Nicholas Pike, geboren op 23 May 1810, gedoopt te Fort St. George (Madras) op 23 maart 1811. 4. Mary Anne Pike, geboren op 19 mei 1812, gedoopt te Fort St. George 16 oktober 1813, gehuwd te Madras op 31 maart 1832 Mr. Robert Constantine Cole, esquire, koopman, overleden Madras 3 augustus 1842. 9 Elizabeth Spicer Moss, gedoopt te Plymstock op 22 november 1751, begraven aldaar op 29 januari 1788. 1. William Moss Pike, gedoopt te Plymstock op 22 juni 1776. 2. Ann Spicer Pike, gedoopt te Plymstock op 7 december 1777. Zij huwt Christopher Pike, haar neef. 4. Nicholas Moss Pike, geboren te Oreston (Plymstock) in 1783, gedoopt te Plymstock op 1 april 1784. 5. Tabitha Moss Pike, gedoopt te Plymstock op 21 januari 1787. 10 Christian Bernardus Dirksz, boekhouder O.I.C, resident Jaggernaikpoeram. 1. Maria Mentie Dirksz, geboren op 14 december 1797, gedoopt te Jaggernaikpoeram op 18 augustus 1799. Zij huwt 31 oktober 1817 te Nellapilly Capt. C.F. Davies. 2. Anna Elisabeth Dirksz, geboren op 17 novembe r 1804, gedoopt te Coringa op 11 februari 1810. 3. Aleida Theodora Dirksz, geboren op 19 november 1806, gedoopt te Coringa op 11 februari 1810. 4. Benjamin Thomas Dirksz, geboren op 23 september 1808, gedoopt te Malapilly op 11 februari 1810. 11 Maria Mentie Gevel, misschien afstammend van Bartholomeus Gevel, die een eeuw eerder vaandrig was aan de Coromandel, hij vertrekt 1719 naar Indië. 17 Ann Laverence, gedoopt te Churston Ferrers op 14 december 1701. 1. Christopher Pike, gedoopt te Churston Ferrers op 23 april 1734. 2. John Pike, gedoopt te Churston Ferrers op 3 juli 1735. 3. William Pike, gedoopt te Churston Ferrers op 3 maart 1737. Hij was gehuwd met Joan. 4. Philip Pike, gedoopt te Churston Ferrers op 19 juni 1739. Hij was gehuwd te Plymstock op 12 juli 1760 met Mary Winston Pearse. 5. Ann Pike, gedoopt te Churston Ferrers op 17 september 1742. 6. Elizabeth Pike, gedoopt te Churston Ferrers op 12 maart 1744. 33 Penelope Kelly, gedoopt te Stoke Gabriel op 12 juli 1669. 1. Anne Pike, gedoopt te Stoke Gabriel op 19 oktober 1699. 3. Nathaniel Pike, gedoopt te Stoke Gabriel op 24 februari 1702. Hij was gehuwd te met Eleanor, overleden te Brixham op 4 januari 1747. 5. Philip Pike, gedoopt te Stoke Gabriel op 2 september 1707. Freeholder Churston Ferrers 1734-1747, hij was gehuwd te Exeter op 17 juli 1733 met Edith Crews. 35 Ann, begraven te Churston Ferrers op 12 juli 1738. 1. Michael Laverence, gedoopt te Churston Ferrers op 25 december 1689. 2. Mary Laverence, gedoopt te Churston Ferrers op 12 april 1691. 3. William Laverence, gedoopt te Churston Ferrers op 28 januari 1694, begraven aldaar december 1724. 69 Embline Pearce, gedoopt te Churston Ferrers op 14 juni 1615, begraven aldaar in september 1691. 139 Weltinge Harry, begraven te Churston Ferrers in juli 1660.